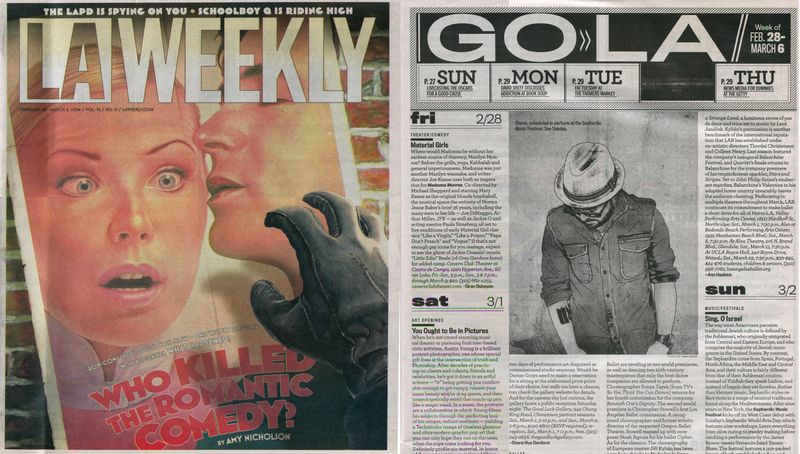 BROOKLYN VEGAN 2013 feature on the festival, its opening night with Moshav and the music video we produced with Moshav and Matisyahu! BLUE PRINT Miki Gavrielov and SMF feature. TIME OUT will be featuring SMF in their “Own this City” (1st time / 2nd time) section two weeks in a row and list SMF as “101 Things to do in Winter” two weeks in a row, both in print and on web. THE JEWISH WEEK feature on SMF will be in their Friday paper (Nov 26th), be on the look out. 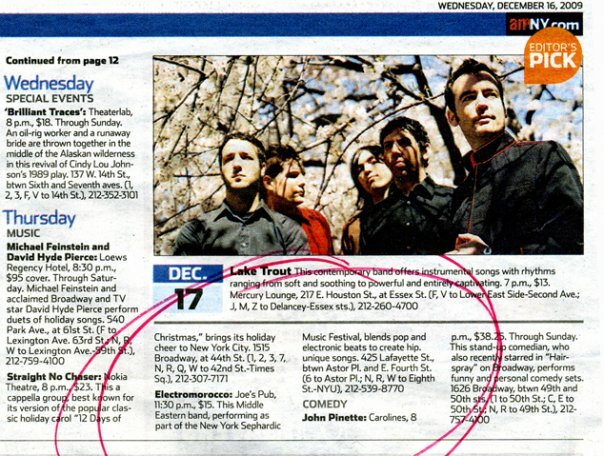 NY POST’S SUNDAY EDITION (12.13.09) includes a feature article/2 page spread on the festival, its bands, its goals and the founder himself, Erez Safar. for the culture junkie -Shemspeed.com, a Web site showcasing a variety of hip Jewish music from around the world, sponsors this weeklong festival of Sephardic music and culture. Events will be held all over the city and will represent a wide range of music and approaches, from an audience-interactive panel discussion at the Center for Jewish History, to Ladino Night at The Spanish and Portuguese Synagogue, to a performance by Hasidic hip-hop sensation Matisyahu at the nightclub Webster Hall. Basya Schechter and Pharaoh’s Daughter sublimely conjure Judeo-Arab-Mediterranean musical concoctions. Their FMU session is a tune-up for a December 16 gig at the Knitting Factory Brooklyn – part of the annual Hannukah-sync’ed multi-venue Sephardic Musical Festival. 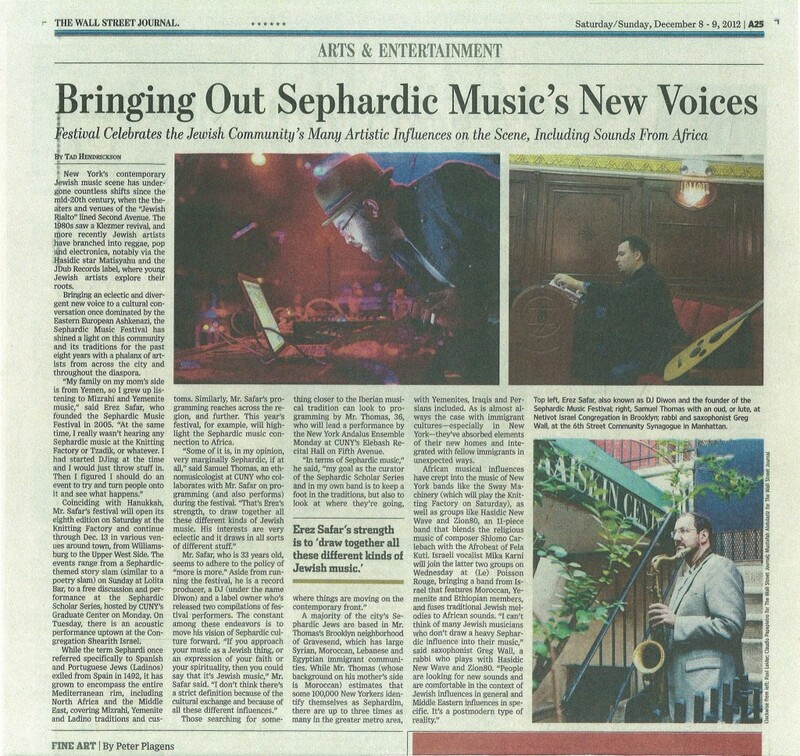 The NY TIMES features the Sephardic Music Festival in their Arts & Leisure weekend edition! 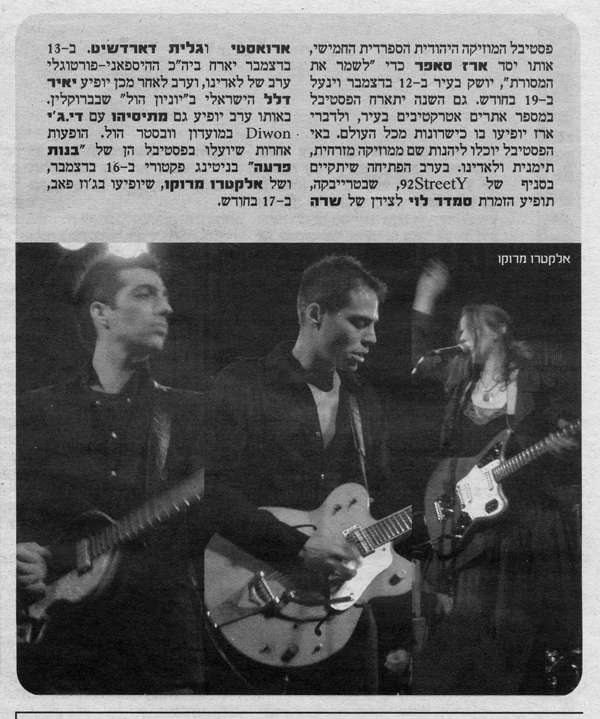 Yediot Achronot features the Festival in their weekend edition! For most New Yorkers, “Jewish music” means klezmer: plaintive fiddles, wailing clarinets and other vestiges of a largely vanished Eastern European culture. But at the Sephardic Music Festival, a New York City tradition that last night entered its fifth year, the world of Jewish music gets explored from an entirely different angle, focusing on the aural legacy of Jewish communities from Spain and the Muslim world. Kicking off yesterday (DEC 12) at the 92nd Street Y in Tribeca, this year’s line-up will stretch across seven nights of programming, with highlights drawing on the traditional sounds of Iraq, Yemen and other distant communities. Unfolding at venues including Webster Hall, Joe’s Pub and Brooklyn’s Knitting Factory, performances at the annual Hanukka series will also mix in contemporary elements from a variety of other musical genres – including the reggae of the Hasidic performer Matisyahu and club-ready rhythms from local rappers. Showcasing musicians from Israel and the New York area, the festival will open with a concert by Smadar Levi, a Sederot native who draws on her family’s Moroccan heritage as she sings in Hebrew, Ladino and Arabic. She’ll be joined at the show by the Sarah Aroeste Band, a group that also strives to preserve Ladino – a Spanish-Hebrew hybrid that developed in pre-Inquisition Spain – with the help of rock, funk and jazz elements. Rounding out the mix for the evening is Galeet Dardashti, a New York transplant from Texas who comes from a line of Jewish musicians from Iran. Depending on the show they attend, festival-goers may hear a relatively traditional mix of Middle Eastern sounds, though other performances will combine those sounds with additional styles. While groups like Pharaoh’s Daughter and Electro Morocco have gained a New York City following with their Sephardic-flavored sounds – both bands will also perform at the festival – the genre has yet to develop its own “scene,” although Safar says that “pockets” of fan support continue to emerge. The festival seeks to boost that enthusiasm while also exposing new listeners to the style. Several thousand music enthusiasts have attended festival concerts in recent years, and Safar estimates that 1,000 will turn out for the biggest show planned for the 2009 event. That concert, interestingly, will be headlined not by a Sephardic performer but by Matisyahu, the Hasidic reggae star who became one of this decade’s more unlikely pop breakthroughs with his Top 40 hit “King Without a Crown.” The December 14 show, scheduled at the Lower East Side’s Webster Hall, will match the former yeshiva student with Diwon, who will add Sephardic elements to the performance through his dance-friendly remixes. For listeners drawn to the concert because of Matisyahu, the Sephardic music might prove a small revelation of its own – or so it is hoped. With one evening devoted strictly to Ladino music, the festival will also offer an academic look at Jewish music through its Sephardic Scholar Series. The joint performance and discussion, another festival highlight, will showcase Ladino/flamenco duo Aviva and Dan, ethnomusicologist Samuel R. Thomas and filmmaker Lisa Katzman. See below for press on the past years. 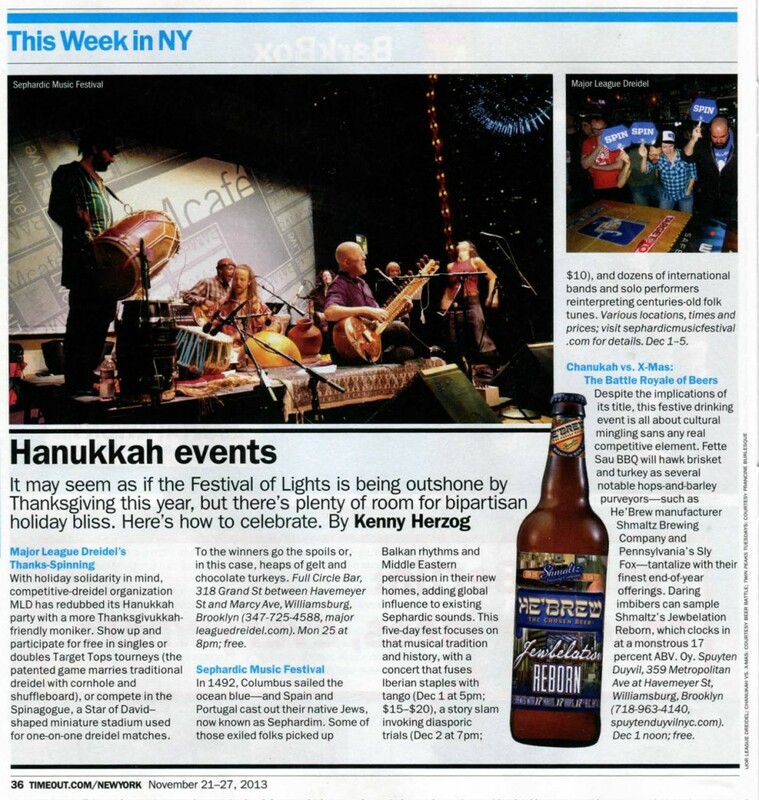 Time Out NY Feature and Hightlight the SMF, check newstands December 18th!! “Our Hannukkah-side suggestion is the annual Sephardic Music Festival curated by NY Sephardic DJ / musician / electronica artist Erez Safar a/k/a Diwon. The festival coincides with that not quite high holiday, December 21-28. What is Sephardic culture? The Sephardic Jews most purely are those who trace their roots to the Iberian peninsula before Jews were expelled by Spain in 1492. But of course once they were expelled they spread out, to the Middle East, Africa, Asia etc., and the lines blur between those with direct links to pre-expulsion Spain and Jews simply from the places the Iberian Jews wound up. Another way to look at this festival is as the un-Ashkenazi festival. (Ashkenazi being the Jews of Eastern European roots who are the majority Jewish population in New York.) With, um, a few Ashkenazi ringers among the musicians for sure – but NOT a whole lotta klezmer which of course is the Ashkenazi go-to party music. While there isn’t exactly a Sephardic music “scene” in New York, there are many artists either from Sephardic backgrounds, or who have chosen to explore Sephardic themes in different ways within their music. The idea of this festival is to raise public awareness about this minority-within-a-minority. And of course put on some good shows. And in doing so there is quite a range of music. From the bombastic “Hasidic Hendrix” Yossi Piamenta – now that’s a Jewish wedding! But you see the point of the festival is not really to make one specific musical point – there’s a wide range. But the emphasis will be on groups operating in the Sephardic realm and by extension something a little different from the usual klez / East European orientation of Jewish music in New York. One project that’s especially noted to for its academic, historical / research based approach to the music is Asefa. The group is led by Samuel Thomas, a New York-based musician and ethnomusicologist of Moroccan-Sephardic heritage. In addition to performing at the festival, Thomas will curate a concert and discussion at the Center for Jewish History, 15 West 16th St on Sunday afternoon Dec. 21 featuring two of the more purely Sephardic groups in the festival: The Victor Esses Tarab Ensemble, of Syrian Jewish background; and Elie Massias Flamenco-Ladino. Thomas has a website dedicated to his musical explorations: “Jewish Awareness Through Music“. Thomas told me that for him, perhaps the strongest way to create musical work with a true Sephardic root is through the texts: Through links to the work of certain poets of Sephardic Spain who were active (of course) before the Jews were expelled at the end of the 15th century. So he bases many of his texts on surviving texts from those poets, some going back as far as 1000 years – or, texts from poets after that period from places the Sephardim moved to, like North Africa, who followed the stylistic guidelines of those poets. But he makes musical connections too – for instance by incorporating elements of Moroccan Gnawa music. Jews and Gnawa rubbed shoulders in Morocco generations ago much like Jews and Roma did in Eastern Europe. Below you can see (well, barely – but definitely you can hear) Asefa exploring the Gnawa-Jewish musical connection. Cultural programming aimed at young, with-it Jews has only grown more sophisticated since the inaugural Matzo Ball, and other Hanukka-inspired events are no exception. For the entirety of late December 2006, Jewish population centers around North America are being taken over by a myriad of nightlife options targeting Jewish residents in their 20s. Most of the parties are music-oriented, but all are aimed at diversifying each city’s cultural offerings during a season dominated by Christmas. One such event is the second annual Sephardic Music Festival, a New York City event being planned and produced by Modular Moods, a record label at the forefront of Jewish progressive jazz and electronic music. The organization has high hopes for the crossover potential of festival performer Y-Love, an African-American Jew who raps in Hebrew, Arabic, Aramaic and Yiddish. Y-Love will take the stage along with ethnic groove band Pharaoh’s Daughter for the festival’s kickoff event, while performers at the festival’s other shows include Jerusalem hip hop act Hadag Nachash, piyut jammers Asefa, Ladino diva Sarah Aroeste, social action balladeer Aliza Hava and Connecticut’s Afro Semitic Experience. Sephardic Music Festival promoter pushing the Mizrahi sound. Not always, Erez a.k.a. dj handler would reply, emphatically. His lastest broadside in the campaign is the Second Annual Sephardic Music Festival, which kicks off a week of concerts, parties and dances on Saturday evening, Dec. 16. From its earliest planning stages, Handler had always intended that last year’s event would be the first of many. “It was always promoted as the ‘first annual,’” he reminds his interlocutor. He comes by his love of Sephardic and Yemenite music naturally. His mother is a Yemenite Jew and when the family was in Israel, he was taken to Yemenite synagogues regularly, where he fell in love with the sinuous modes of Mizrahi music. The first event was an ambitious launch that coincided with Chanukah, and featured such high-powered acts as Pharaoh’s Daughter, Sarah Aroeste, Divahn and Modular Moods artist Y-Love. Much to Handler’s delight, the festival was a huge success. Needless to say, he’s hoping for more of the same this year. The event will again fill the eight nights of Chanukah and features several of last year’s faves as well as the Israeli hip-hop group Hadag Nahash, jazz diva Ayelet Rose Gottlieb and the brilliant song interpreter Ramon Tasat. The Second Annual Sephardic Music Festival opens on Saturday, Dec. 16 at 8 p.m. with Y-Love, Pharaoh’s Daughter and special guests, at Makor (35 W. 67th St.); for the entire schedule and ticket information, go to www.sephardicmusicfestival.com. Looking for an edgier sound at this year’s Sephardic Music Festival. In a way, you might say that by staging his annual Sephardic Music Festival in New York City, Erez Shudnow, better known as dj handler, is paying back an old debt. a dying language and that Yemenite and other Sephardic music are underappreciated, particularly as the klezmer revival has helped to increase awareness of Yiddish. There is another factor at play in the decision to stage a Sephardic music festival, he added. Or to the Jewish public, for that matter. Despite the success of such Sephardic- and Mizrahi-flavored acts as Pharaoh’s Daughter and Sarah Aroeste (both of whom are performing in the festival this year), the overwhelming majority of Jewish music groups in the marketplace are klezmer or Yiddish in language or musical mood. And handler readily admits that the dominant feature of the Sephardic audience up to now has been its musical conservatism. “The point for me was to stay away from some of the aspects that make Sephardic music appealing to the older crowd, which totally loses the crowd that won’t start listening to traditional music for another 20 years,” he said. For an example of the edgier, hip-hop-informed musical mix that he aims for in programming the festival, handler points to a mix tape he compiled, which is available at www.modularmoods.com/store. This has been a busy year of growth for handler and his various Jewish music enterprises. In addition to the full slate of releases on modular moods, the name of the label he founded, he has started a Jewish music Web site, www.shemspeed.com. Not surprisingly, this year’s Sephardic Music Festival is also bigger than its predecessors. The festival is both a labor of love and an act of collaboration between many New York music presenters. “The whole festival comes together through a lot of love and collaboration,” handler said. “Brice Rosenbloom [founder of Music Without Borders] always helps out a lot. The guys from Soulfarm who have extended their BB King “first night of Chanukah” gig to us for our Opening Night. It was perfect timing because Consuelo Luz just happens to be in New York at that time. She lives in New Mexico and has been included on all sorts of compilations ranging from Buddha Bar to Putumayo collections. We will be featuring her as well as [jazz musician] Ayelet Rose Gottlieb and Sarah Aroeste at the Opening Night BB King show. The last night of the festival is Pharaoh’s Daughter and Pshutei Ha’am at the Knitting Factory. But for the Brooklyn folks who like staying around there we put together a show at Southpaw with Yossi Piamenta. The Third Annual Sephardic Music Festival will run from Dec. 4-11 at venues all over New York. For information, go to www.sephardicmusicfestival.com. Benjamin Cardozo was one. So was Benjamin Disraeli. Some believe that FDR may have been one, at least on his mother’s side. Camille Pissarro, Harold Pinter, Murray Perahia… Sephardic Jews, every one. And yet, despite their notable achievements throughout the Diaspora, Sephardim have been noticeably absent from the North American Jewish music scene. (In Israel, where Sephardic Jews represent a much larger portion of the population, the situation is far different.) Until recently, you’d have been lucky to find even one Sephardic ensemble for every 10 nouveau klezmer bands on the Jewish music circuit. But that appears to be changing, thanks to the efforts of people like Erez Shudnow, aka DJ Handler. A turntablist who samples everything from Brazilian baile funk to Yemenite songs and Ashkenazic cantillation, Handler also plays drums with Orthodox avant-klezmer outfit Juez and runs both a music label and a production company. In addition, he’s the driving force behind New York’s first Sephardic Music Festival, scheduled to run during the eight nights of Hanukkah at venues ranging from Mo Pitkin’s to Makor. Although the term “Sephardic” is often used as a catchall for anyone who isn’t of Ashkenazic descent, it properly denotes those Jews whose origins lie in Spain and Portugal. Following the expulsion of the Jews from the Iberian Peninsula in 1492, the Sephardim were dispersed throughout North Africa and the Mediterranean, where they continued to speak the various Judaeo-Spanish dialects that had evolved under Moorish influence. They also retained, and continued to develop, their own distinctive cultural practices — including their music, which bears the imprint not only of their earliest surroundings but also of the lands (Greece, Turkey, Morocco) in which they settled. The texts of many traditional Sephardic songs, for example, are cast in Hispanic poetic forms, while Sephardic melodies are often cast in Arabic modes. While the Sephardic Music Festival will include traditional Sephardic acts like Joe Elias and his Ladino Ensemble, the emphasis will be on contemporary music, from the Sephardic jazz engineered by Anthony Coleman and Uri Caine to the various brands of Sephardic pop and rock performed by Sarah Aroeste, Raquy and the Cavemen, and Pharaoh’s Daughter. There will even be some Mizrahic sounds on offer, most notably from Divahn, an all-female acoustic Sephardic-Mizrahic quartet led by the musician and anthropologist Galeet Dardashti. (Though often lumped together with Sephardim, Mizrahim are in fact a group unto themselves — namely, Middle Eastern and North African Jews who did not make a pit stop in Iberia.) There will also be plenty of hip-hop and dance beats served up by rappers and spinners like Y-Love, Jake Break and Handler himself, all of whom will appear on Israeli Hip Hop Night. One of the central goals of the festival is to increase awareness of Sephardic music among younger audiences, and to make it as hip — and as popular — as modern klezmer. Aroeste, a singer whose grandparents immigrated to America from Salonika, Greece, was herself inspired to form a contemporary Sephardic ensemble after meeting Frank London, one of the leaders of the progressive klezmer movement. Though she studied traditional Sephardic song in Israel, her principle goal is to render the Sephardic tradition more relevant to her own peer group. “I grew up in America, and I’m a young, modern American woman. I love the traditional style, but it’s not necessarily what I feel in my own being,” she told the Forward. “I still make traditional music, but I make it new.” To that end, Aroeste sets a variety of lyrics — some deriving from traditional Hispanic narrative ballads, others of her own design — to pop and rock grooves, while continuing to use traditional Sephardic instruments like hand drums and the ubiquitous Middle Eastern lute known as the oud.